Finding the cheapest dumpster rental on the market is something that many customers are looking for when they set up to rent a container for junk removal. Especially if you are renting a dumpster for a move or renovation, your project probably already has a budget you’re trying to minimize. Moving can be expensive, as can renovating your home, replacing your roof, building an addition, or any other kind of related project. The desire to keep costs down is an entirely human impulse, hence the drive to find a cheap dumpster rental. As you search for dumpster rental options in the Albany area, though, make sure you aren’t shopping based on price alone. Cost and budget are considerations that should impact your final decision. However, if you only pay attention to price, you’re probably going to hit a few snags with your rental. For instance, you might end up with a dumpster that isn’t big enough for your purposes, or you might forget to account for delivery fees and other add-on costs. To ensure the most satisfactory dumpster rental service possible, there are numerous factors you should consider beyond price. Below, we’ve outlined a few questions you should try to answer before you rent a dumpster. Each answer you give will help shed some light on what you need from your dumpster rental service. What are you going to put in your dumpster? What is the nature of your junk removal project? If it’s a building, renovation, or roofing project, then you probably need a dumpster primarily for discarded building materials and construction debris. If it’s a basement or garage cleanout, then you are probably looking at a slightly more random collection of junk. In such a case, it’s a good idea to take a walk through the area that you will be targeting with your cleanout. In particular, keep an eye out for large items (bookshelves, couches, other furniture), electronic waste (TVs, DVD players, stereo equipment), and appliances (refrigerators, ovens, etc.). Some dumpster rental companies have restrictions on certain items, including E-waste, appliances, and mattresses. If you need to get rid of any of these items, you will want to look for a dumpster rental company that doesn’t have those restrictions. As for large items, it might not be a bad idea to measure the dimensions of bigger stuff to make sure you are renting a dumpster that can accommodate them. As a rule, you can’t have any items sticking out of the top of a dumpster at pickup time. If you have bigger items that won’t fit in the dumpster you are eyeing, you might need to consider a larger container. Where are you going to put your dumpster? This question is a more pivotal one than many people realize, especially when they are renting their first dumpster. If you are cleaning out or renovating a personal residence, your goal should be to get the dumpster as close to the house as possible. Usually, the best spot for the dumpster is in the driveway right near the garage. That way, you won’t have far to go when you want to deposit items in the container. The proximity will save you extra steps and minimize the amount of heavy lifting you must do, which will allow you to work with more speed and efficiency. If there isn’t space for your chosen dumpster in the driveway, you have two main options. The best bet is to look for a smaller dumpster. Large bins can accommodate a lot of junk, but they also take up a tremendous amount of space. If you don’t have that kind of space, though, you’d be a lot better off renting a smaller dumpster. Look for something that is driveway-friendly but still offers a considerable amount of capacity. Your second option is to put your dumpster out in the street, which is something you should try to avoid unless you have absolutely no other choice. Not only is it a long walk from the house to the street, but your city or town might also have restrictions for using the street for such a purpose. It could be that you will need a permit to put a dumpster out in the street, which is a big inconvenient hurdle in a process that should be convenient and simple. There may also be limitations on how long you can leave a dumpster in the street—limitations that don’t necessarily mesh with your dumpster rental timeline. Hopefully, answering the two questions above will help you solve this one. However, the fact is that choosing a dumpster size is extremely difficult even in the best of circumstances. Often, dumpster rental companies will have five or six different sizes from which to choose. The cheapest dumpster rentals are usually the smallest bins, around ten cubic yards in size. However, you can also rent containers as big as 30, 40, or even 50 cubic yards. With so many options at your fingertips, how do you choose the right bin? The fact is that most household cleaning projects won’t demand a dumpster bigger than about 12 cubic yards of capacity. Even large-scale renovations and building projects rarely require 40 or 50 cubic yards of space. If you don’t want to end up paying for dumpster capacity that you won’t use, you should steer toward the smaller end of the spectrum. The chances are that you have less junk to get rid of than you think. Better yet, look for a dumpster rental company that bills based on how much container space you use. That way, you pay only for what you need—no more, no less. 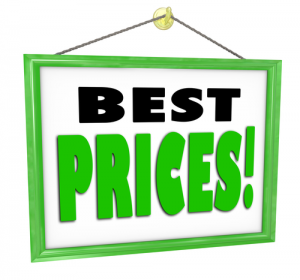 If you start your search with the goal of finding the cheapest dumpster rental possible, then you might convince yourself that you don’t care about anything other than price. If you can find a bargain, you don’t need anything else. When you start thinking about what you want from your dumpster rental, though, you might second-guess that mentality. Surely you want a company that offers strong customer service, at very least. If you have any questions, you want to be able to call your rental company and get satisfactory answers. You want your dumpster to be delivered on time and picked up on time, to save you from wasted minutes or hours. You want a business that is honest about its pricing estimates and won’t hit you with hidden fees after the fact. The company willing to provide these services and assurances isn’t always the cheapest one. There are other perks or services you might desire as well. For instance, if you are throwing away a lot of “restricted” items (such as the appliances, mattresses, and E-waste), you may want to make sure those items are being disposed of safely and ethically. The reason some dumpster rental companies won’t take these items is that they aren’t safe to throw away at a landfill. Some landfills even ban items in these categories because they can be harmful to the environment. E-waste, for instance, can leak chemicals into nearby soils and groundwater sources. Mattresses, meanwhile, are bulky and difficult to compact, which can cause dangerous air pockets to form in landfills. By hiring a green dumpster company—one that sorts trash and recycles, donates, or reuses items where possible or necessary—you can do your part to safeguard the environment. Bottom line, it’s not a bad thing to search for the cheapest dumpster rental in Albany. We all want to save a few bucks and keep our budgets. Just make sure you aren’t ignoring other factors along the way. This entry was posted in Construction Waste Disposal, damaged furniture removal, dumpster rental and tagged construction debris, debris removal, junk hauling, junk removal on May 3, 2018 by Julian Torres, "JT". Last updated December 7, 2018 .